Stanford geoscientist Ken Caldeira often says that the fossil-fuel energy system "uses the sky as a waste dump." Carbon dioxide (CO2), the waste created by burning fossil fuels, has been building up in the atmosphere for centuries. CO2 emissions are setting new records every year, according to the Global Carbon Project, and 2014's emissions of this greenhouse gas will exceed the 40 billion ton level. The world's nations are meeting in New York to start hammering out goals and strategies to reduce carbon consumption. Natural gas—methane or CH4—is often called a "bridge fuel" that will help us move away from the carbon-based energy system. As its chemical formula suggests, it relies on burning hydrogen, which yields harmless water as its waste product, more than burning carbon. And methane is abundant in the ground, and the industry is mature. There's a lot to like about methane, and the arguments are strong. By economics and government policy, methane is already replacing coal as America's preferred fuel for power generation. Two major problems with methane are that it still burns carbon (although less than half as much as coal) and that the gas itself is a potent greenhouse gas. Wherever it leaks into the air, methane does harm. Two new studies shed light on each of these problems. In the first paper, published this week in the journal Environmental Research Letters, lead author Christine Shearer of UC Irvine argues that moving to methane might not yield us any gain in the fight against carbon. Her research team started with forecasts of the natural-gas supply from 23 different experts. This "expert elicitation" approach doesn't nail down a precise estimate, but it does a good job of defining the range of plausible possibilities. They then used an energy model named MARKAL to see how those forecasts would change the mix of energy-producing technology, and the CO2 emissions that result, between 2015 and 2055. No matter how much methane is available, the results are pretty much the same: methane competes with coal, in line with the "bridge fuel" scenario, but it also competes with renewable fuels (solar, wind, hydro, geothermal, biomass, tidal, etc.). Total carbon emissions differ by less than 10 percent under the whole range of gas supplies. 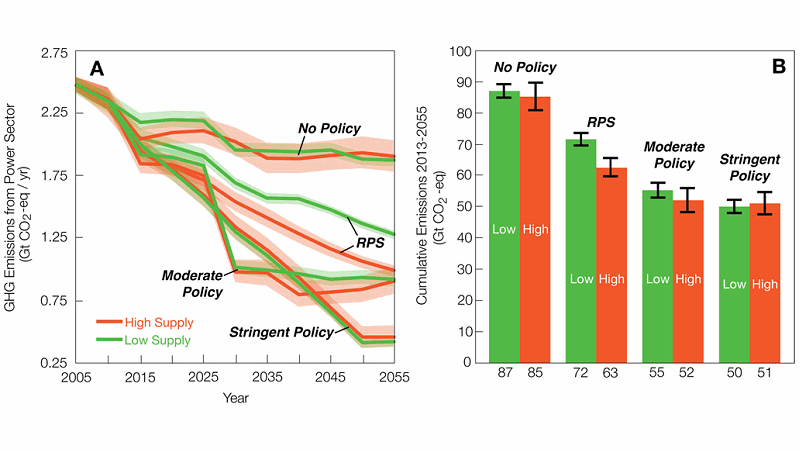 The way to make the biggest change in emissions, the study suggests, is climate policy. Without a policy that requires movement toward renewable energy and away from fossil fuels, natural gas will still leave the sky as a waste dump. Shearer's study assumes that natural gas production has little or no methane leakage. But a study in this month's Geophysical Research Letters led by Eric Kort, of the University of Michigan, used seven years of satellite observations to look at the large gas fields of the Four Corners region in the Southwest. It found that the area emitted nearly 600,000 tons of methane per year, or 1.8 times as much methane as the best "bottom-up" inventory suggested. That is, when a satellite looks down at the actual atmosphere, it finds twice as much methane as we estimate from surveying known methane sources on the ground. Probably it's a combination of emissions going undetected and emissions going unreported. If we end up needing a world carbon monitoring network, along the lines of our current nuclear bomb testing network, this is probably how it will be done.